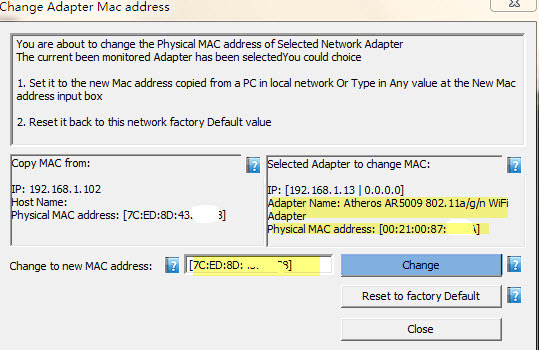 Change MAC address of a adapter freely ? Clone MAC address from a local network by one click? Yes. With netCut 2.0.9, it’s do able . and it’s easy/free/fast/safe. I hope this help some users that use netcut for years and had discover other useful than “cut” . Enjoy! 1. Select a adapter to change. 2. NetCut Stop send packets to the gateway and the been dealed PC. 3. NetCut read the MAC address from the input box and write it as the MAC of your current netCut selected network adapter. 4. Disable the network adapter. 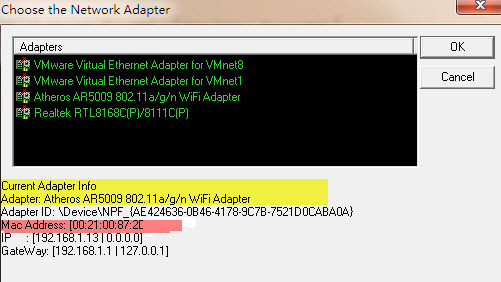 5. re-enable the network adapter. 6. netcut resume monitor/sending packets to gateway .